Close to the A127 and M25 motorway, just 15 minutes walk to Basildon town centre and virtually opposite Northlands Park. Contrary to expectations, erstwhile 70s comedian Lenny Henry wont be sinking his plump, cuddly torso onto your king-sized bed at any point during your stay, nor helping you with your luggage. And thats no bad thing. 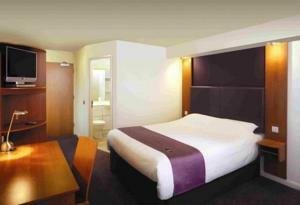 Premier Inn has now pretty much cornered the market in providing crisp, clean budget bed breakfast accommodation. And if it is a no-frills brand you really wouldnt notice it, not with an all-you-can-eat buffet breakfast at the adjacent Beefeater Watermill Restaurant free to kids eating with two adults, ample free parking and some of the largest, comfiest beds in England. Difficult to beat location-wise: close to the A127 and M25 motorway, just 15 minutes walk to Basildon town centre and virtually opposite Northlands Park offering guests to Basildon 60 acres of parkland, fishing lakes, rose gardens and childrens playground.